The first crushing notes of Old Black emanate from some anonymous American frontier, dusty and unpredictable, striding on its terrain while wandering determinedly and focused. You get the sense that, throughout Earth’s Angels Of Darkness, Demons Of Light: 1, stories are being spun using the band’s instrumental language and economy of notes, traditional narratives normally told over a backdrop of folk music, blues and country. Dylan Carlson plays as if exiled in some very distant, unpopulated part of his imagination, a vagabond absorbed in his internal surroundings, uncertain of where the elusive horizon will lead. The notes come crashing down, the percussion slow and reliable. A quivering bow dances across a cello’s strings. The low end holds everything up like it’s supposed to. Old Black establishes the album’s purpose and Earth maintains the rugged nature of their namesake. As country music continually laughs at its origins with sugarcoating and mindless accessibility and cliché, (as does folk music), Carlson takes his drone metal vehicle and ties some roots to its persona. Angels Of Darkness, Demons Of Light: 1 becomes heritage music in that it owes much of itself to a seeming love of country, and I’m not speaking in terms of blind patriotism, NASCAR and Fox News. There is no way to misunderstand Carlson’s intentions like so many did with Springsteen’s Born In The USA: This is reinterpreted music of American origin. Alan Lomax could’ve recorded this. Intact is Earth’s preoccupation with repetition and song length. Carlson carves much of his role out of minimalist riffing, cellist, Lori Goldston, the melody maker beautifying each track. The somewhat severe Father Midnight couples stronger notes with sorrowful follow-ups. As the song continues it softens and Goldston’s role begins to slowly take more precedence as Carlson heightens his tone. It’s a subtle transition and it allows the 12+ minutes of music the benefit of progression. Time signatures aren’t overt, changes thoughtfully organic. The shortest song on the album, Descent to the Zenith, a mere 7 and a-half minutes, poises itself like a revelation or a mind-altering sunrise. Hell’s Winter follows with solid resolve, a little less ponderous a disposition. The title track is adrift in its self-generated expanse and epic-centric, worthy of film score categorization. The guitar notes sporadically echo across Karl Blau’s sprigs of bass tone while Goldston fades in and out of prominence. You sink into it, meditating to some degree even after Adrienne Davies taps the snare drum’s edge with a hollow stick, anchoring the aimlessness. I want to call this a “classic” album. 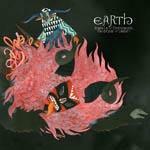 I’d like to state with little or no hesitation that Earth’s newest album manages to redefine American roots music, their impressionistic colossus a potential crossover for fans of antiquated country, folk and blues music. I’d like to carry the album’s optimism and strength in my attitude toward its future, hopeful that it would reach beyond Earth’s usual demographic. Most of all, I’d like to list Angels Of Darkness, Demons Of Light: 1 amongst the ever-expanding and illustrious list of rock n’ roll’s most important albums. But, that’s asking a lot. As music has continually evolved, in many ways its elders have been forgotten. The desolate plains of America bred a lot of what we come to take for granted, as had the bustling cities while people began to figure it all out. We have it too easy now, despite our lives growing more and more complicated. There seems to be a misconception about what constitutes apple pie “America,” flag waving, politics and war somehow at the forefront of our development. Art suffers. It’s what truly separates us from primitivism, the ability to think abstractly or creatively, ideas truly the root of our progress as a people. Where would America be without the blues? Without jazz? Without rock n’ roll? Would we be half as interesting were it not for our ability to communicate our thoughts, our hopes or our dreams poetically with the aid of our music? Art matters less, or is at least seen as expendable, which is why Earth’s masterful impressions of folk-infused rock music will not capture the public’s imagination. America’s attention span can no longer accommodate an artist’s vision, unless it’s easy to digest or used commercially. Cynics might say, “Why bother?” Really, can we argue with that logic? It’s possible, though, that Earth doesn’t have to achieve national acclaim to qualify as classic. Maybe they just have to affect a few of us that listen and time can eventually make its own claim.